This has won several medals. Well, let’s see. The smell is light fruity at first, but some darker fruits comes to mind as well. All mixed with some honey sweetness. There is much more sherry influence in the taste. Raisins and oak is dominant, but without the tannins. Not much changes in the finish, just a bit more sweetness. 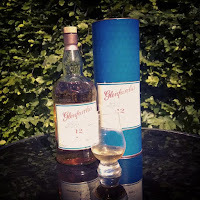 It is a fine 12 year old, but it lacks a little in the smell, the finish dies rather fast and it is not that challenging. I will rate this 85/100 (20/22/21/22).